Choosing the material for the floor, some people prefer wood. Undoubtedly, this material is more environmentally friendly and aesthetically pleasing. However, such a coating has disadvantages. Wood – a beautiful natural material. It is environmentally friendly, retains heat well. Wood can give almost any color using stains. Especially effectively looks like a wooden surface covered with two or three layers of lacquer. Some people, who decided to build a new home or renovate an existing one, want it had wooden floors. However, skeptics argue that such technology is complicated, expensive, and hardwood floors eventually deteriorate. What are the pros and cons of hardwood floor? Floor, covered with wood, especially if it's well sanded and coated with lacquer, very beautiful. Perhaps for its aesthetic qualities can be compared with only hardwood floors. House with wooden floors immediately evokes a feeling of warmth, comfort and harmony. And it is very important to maintain a healthy moral-psychological atmosphere in the family. It should be noted that with proper maintenance, hardwood floors are durable. Wood, as already mentioned, environmentally friendly, natural material. Besides, it breathes well, i.e. supports the gas exchange with the environment. Some species of trees, such as pine, spruce, larch, due to the increased content of various resins have antibacterial properties. So the construction of such a tree for a long time without rotting. It is not surprising that an increasing number of people with the first opportunity to get a rustic, wooden house. It can be constructed of logs, timber. Popular also frame houses that can be built in just a few days. Many varieties of wood have beautiful graining. By using stains and colored varnishes, you can add wooden floor to almost any color shade, including simulating expensive, elite varieties (for example, mahogany, rosewood, etc.). Thus, even a small, modest house will look very nice. To lay wooden floor in as any little bit familiar with carpentry and able to use tools, man. However, when building a house, you still should consult with experts. That is, you can do this yourself and save the money that would go to the labor of carpenters. 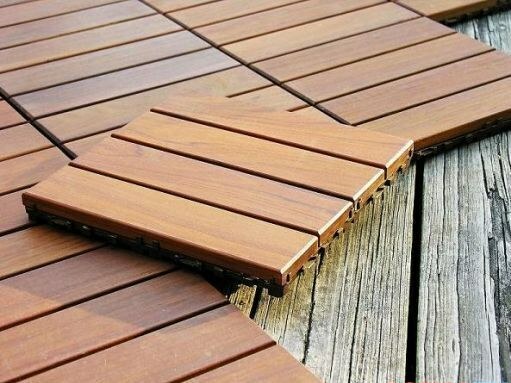 If you use decking, grooved boards, on one of the faces of which have thorns, and on the other slots, to get a continuous floor covering, without the slightest gap. Wooden floors blend perfectly with almost any furniture, design, and also with different types of wall coverings, decorative elements. Finally, wooden floors, due to the low thermal conductivity of wood, retains heat well. This somewhat reduces the probability of diseases of the tenants in the cold period of the year, and also helps to save fuel to heat your home. Advantages of this type of coverage, as we have seen, a lot. And are there any disadvantages? Yes, there is, and a lot of them too. First of all, this type of coverage will cost a fairly substantial amount, even if you do all the work with his own hands, without the help of professionals. Wood floors over time, or due to insufficiently qualified installation, often begin to warp from moisture, crack or rot. Individual floorboards can bend (or even fail). Scratches, dents from solid and heavy objects. That is, sooner or later have to do repairs on the floor. But this involves hassle and expense, even if we are talking about minor, cosmetic repairs. Before you begin to lay a wooden floor, it is necessary not only to lay the joists, trim a wooden beam, playing the role of supports for boards, but carefully align them. It's pretty tedious work, especially if you decide to install the joists, adjustable for height. It must be remembered that the thickness of the batten should be at least two times less than the height of the support bar. This is necessary to ensure that the joists are not warped by moistening or drying of the floorboards. Prior to lay floorboards, the floor must be warmed, poured into the spaces between joists concrete block, paving or synthetic insulation material (e.g. mineral wool, polystyrene). That is, again, required additional work and expenses. In addition, the tree, with all its advantages, flammable material, and it can also be attributed to the disadvantages of this type of flooring. Finally, if the room has a low ceiling, flooring wooden floors (due to the need for pre-laying lag) will make it even lower. So if you decided to do hardwood floors, first assess your capabilities and weigh all the "pros" and "cons". Consult with experts, rate your strength, as before to take new, it is necessary to clarify all the subtleties and nuances of work.